Epic Games’ Fortnite, out in Early Access, is not one game, but many, all tangled together under one name. It’s a resource management game. It’s a multiplayer third-person shooter. It’s a tower defense game. It’s a collectable card game. It’s a strategy game, a survival game and it’s even a little bit of a role-playing game. Gratifying and uplifting at first, Fortnite quickly escalates into an unmanageable, sprawling to-do list, like several errands all out of the way of each other. 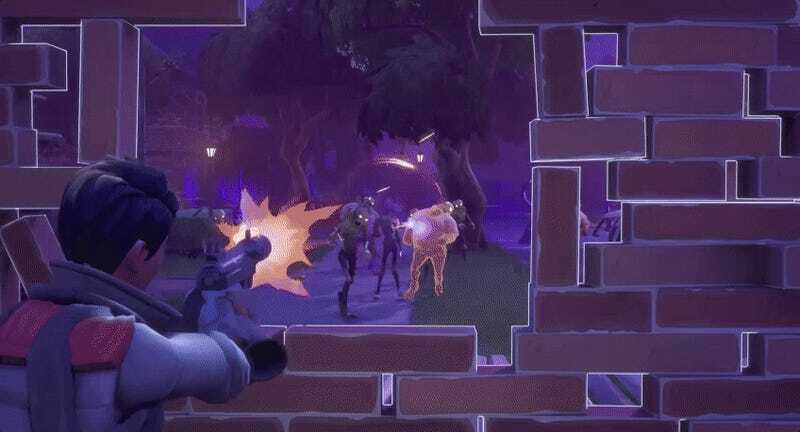 In development for over six years, Fortnite finally debuted on July 25th. It’s set a post-apocalyptic world in which 98% of the population vanishes and regular, epic storms bring in waves of husks. Despite that, Fortnite’s world is a bright one, full of diverse characters in race, gender and body type. With those heroes, players fulfill missions by defending bases that they build from swarms of husks. The player and their teammates are dropped onto a map, where they hack apart everything from fire hydrants to bedframes to mine resources. From those resources, they build a fort to protect themselves and crucial items like shield generators from waves of husks and find survivors. Each class—outlander, soldier, ninja or constructor—has a different specialty, and by delegating well, the team defends that fort with a combination of melee attacks, bullets and traps. I felt different parts of my brain light up as I hustled to mine resources, build and defend forts. Shooting feels clean and sharp with every gun. Mowing down enemies is always satisfying, whether it’s the slow, loud strike of a pistol or the buzz of a semiautomatic. Slashing husks down with a sword also feels effortless, if not a little more dangerous. Importantly, on PC, shifting between combat and building modes is as easy as hitting one button. Within five seconds, your hero can toss a grenade, shell a zombie hoard and construct a wall with a trap attached. Building in Fortnite is also intuitive. Out of three materials, players can erect walls, floors, ceilings, stairs and traps. 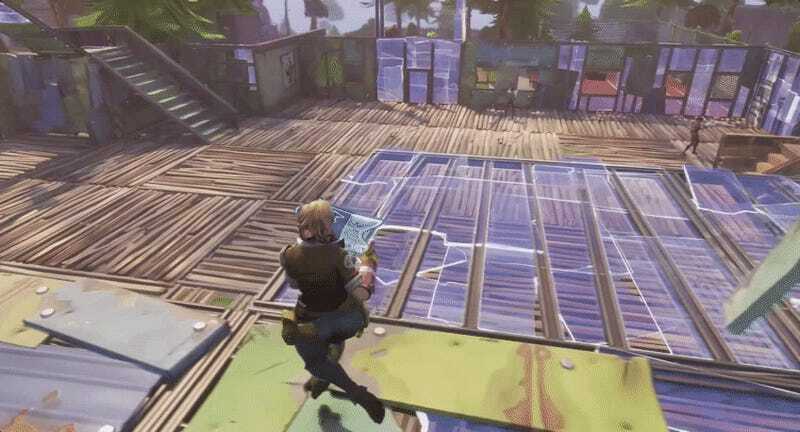 A quick building edit (also one button and a few clicks) can erase the top two-thirds of a wall to accommodate sniping, design a graceful archway or a maze-like deathtrap. When actually completing missions, like finding and rescuing survivors or designing an impenetrable fort to protect a storm shield against waves of husks, Fortnite’s UI is quite easy to grok, even if the mechanics behind it are unrewarding and perplexing. Fortnite’s macro-level gameplay is burdensome at best and, at worst, poorly-designed. The game’s progression schemes are a nightmare. First, its loot system is dreadfully complex and poorly explained. Arbitrary awards, doled out both in low, medium or high-tier treasure boxes and llama pinatas greet players after every small accomplishment. 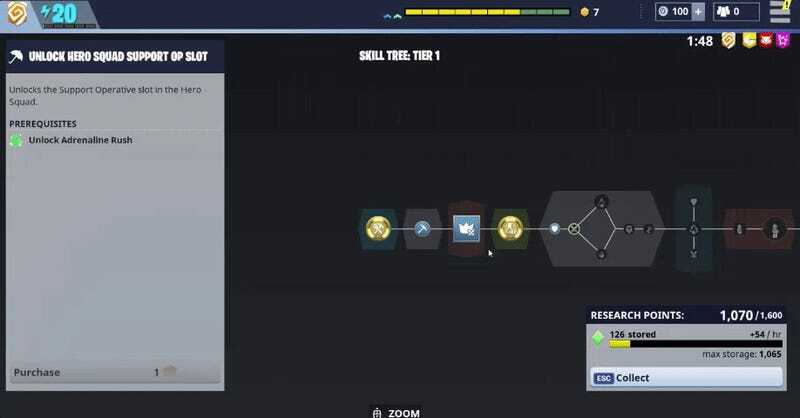 One of these rewards is XP items, which players can spend to level up heroes’ abilities, which progress along complicated skill trees (and there are lots of heroes and lots of abilities). XP items can also help players level up “survivor” cards, another item awarded from loot boxes. 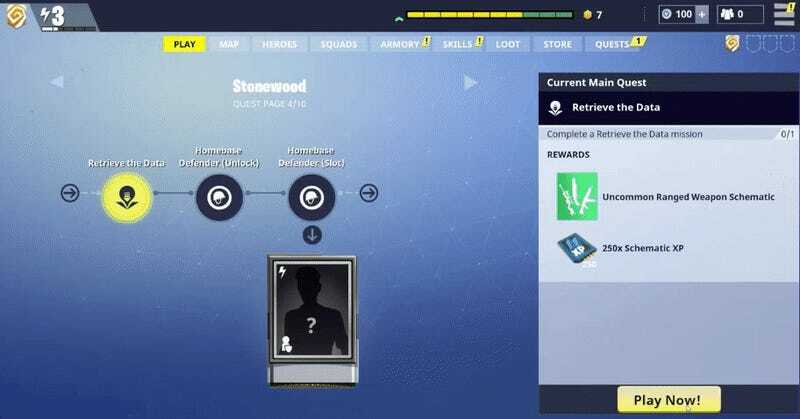 Fortnite does not really explain these survivor cards or their stats or abilities, but ostensibly, they help players defend forts later on in the game. Fortnite is not over-complicated simply because there are too many small abilities among many heroes and characters to micro-manage; it’s over-complicated because, on top of that kind of micro-managing, Fortnite is so many different games. Players must optimize these moving parts to craft the best building, surviving, attacking and scavenging teams. Fortnite’s progression system is too damn much on top of its too-damn-much of a game. Playing Fortnite is like being forced to take off your Gameboy’s screen and autopsy its wires and circuit board between rounds of a fun, polished game. Right now, it’s asking players to do too much under-the-hood engineering of their play experience. Two loot systems, lots of unexplained items and crazy complicated stats and abilities don’t help. It’s even more of a shame because of how well-done and encouraging Fortnite’s main game mode is. With the fat trimmed, Fortnite would be a euphoric take on survival shooters, pleasant at every turn. But, so far, Fortnite’s bulky, overcomplicated progression systems and poor explanation of their importance outweighs how startlingly well the game nails its basics. Luckily, Fortnite is still in early access. Next year, it will go free-to-play. There’s a lot of time for it to pare down to what it’s good at.